Koray Karabulut, MD, Federico Aucejo, MD, John Fung, MD PhD, Eren Berber, MD. Department of Endocrine Surgery, Endocrinology and Metabolism Institute, Cleveland Clinic, Cleveland, OH, USA. Department of Hepato-Pancreato-Biliary and Transplant Surgery, Digestive Disease Institute, Cleveland Clinic, Cleveland, OH, USA. Background: Precoagulation using radiofrequency (RF) has been advocated to decrease blood loss in laparoscopic liver resection. We previously reported on the techniques of RF-precoagulation. The aim of this study is to compare RF-precoagulation with other resectional techniques regarding perioperative outcomes. Methods: Between 1997 and 2010, 75 patients underwent laparoscopic liver resection in a single academic institution. Different tools were used for resection based on surgeon-preference, including RF-precoagulation, staplers or Harmonic scalpel and Tissue-Link. Patient demographics, tumor characteristics, types of resection and technique, perioperative outcome and follow up data were analyzed from a prospective IRB-approved database. Statistical analyses were performed using student t-test and Kaplan Meier survival. All data are expressed as mean ± SEM. Results: Mean age was 60.2 ± 1.6 years. There were 26 (35%) men and 49 (65%) women. The resections performed for primary or metastatic malign liver lesions in 48 (64%) and for benign disease in 27 (36%) patients. Mean tumor size and number of tumors were 4.3 ± 0.4 cm and 1.3 ± 0.1, respectively. The procedure was laparoscopic in 46 patients (60%), robotic in 10 (14%), hand-assisted in 14 (19%) and hybrid in 5 (7%) patients. The resection type was wedge resection or segmentectomy in 45 (59%) patients, bisegmentectomy in 25 (34%) patients and hemihepatectomy in 5 (7%) patients. Resections were performed with RF-precoagulation in 37 patients (49%) and without in 38 patients (51%). The rate of conversion to open was 4% (3 patients). Overall estimated blood loss (EBL) was 119 ± 27 ml, operative time 215 ± 14 minutes, and length of stay (LOS) 3.2 ± 0.2 days. Morbidity was seen in 5 patients (7%) with no mortality. Resection margin for malignant tumors was 7 ± 2 mm. With a median follow up of 16 months, Kaplan Meier median disease-free survival was 14.5 months for these patients. Local recurrence was seen in 2 patients (3%). There was no statistical difference in EBL, operative time, complications, LOS or local tumor recurrence between patients who underwent resection with or without RF-precoagulation. Conclusions: The limitation of the study is that selection of a given technique was surgeon-dependent. 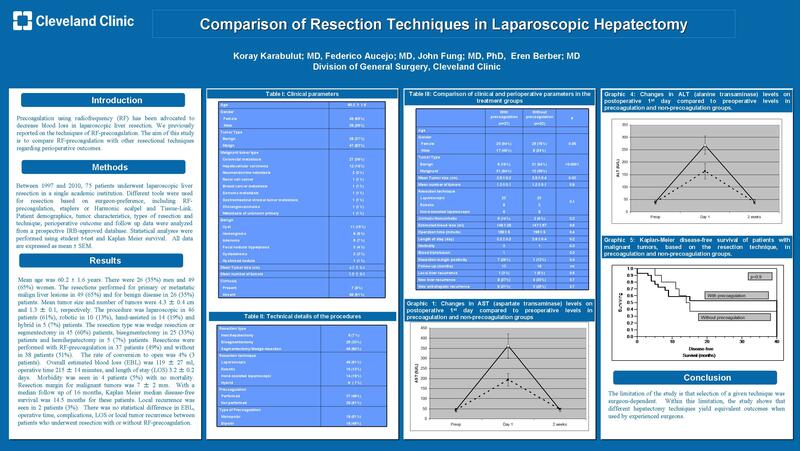 Within this limitation, the study shows that different hepatectomy techniques yield equivalent outcomes when used by experienced surgeons.